Horse Crazy! 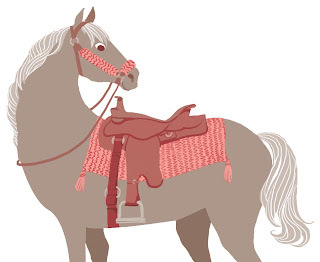 is my new book for kids who love horses, and it's stuffed full of projects, information, and ways to enjoy your passion. Even in school. Even if you don't have a horse (yet). I've loved and written about horses for years, and I still learned a lot writing this book--like how to show model horses, and how to take good pictures of a horse. Horse Crazy! comes out in early August, and I'm celebrating by making my horse a rhythm bead necklace. I wrote about rhythm beads in Horse Crazy!, but I've never tried them before. The first step was to find a bell. I had in mind a brass sleigh bell with a beautiful sound, but downtown Brattleboro, Vermont, at 5:45 on a July afternoon is no time to find a sleigh bell. Rhythm Beads, page 314 of Horse Crazy! I wanted to try it immediately, but we had to take it slow. First I hung it up, and clicked her for ringing it (clicker training, pages 100 and 219). Then I hung it around my neck and groomed her. (Hung it with what, you ask? Baling twine—page 292). Next, I hung the bell around Robin's neck, and went out and lunged her. I was very focused on her not being afraid of it, but within two sessions I realized that it's better than that. She seems to really like it! She's more relaxed, moving with a lot more energy on the lunge, and her ears are forward. Now for a more beautiful cord, and some beads. I bought a few at Beadniks (including turquoise, because it protects horse and rider (page 275), and I'm going to make some i-cord out of some gorgeous nylon ribbon yarn I have left over. (I-cord is short for "idiot-cord"; it's really easy to make.) Robin and I will have matching neckwear! Crochet Halter Pads, page 322 of Horse Crazy! 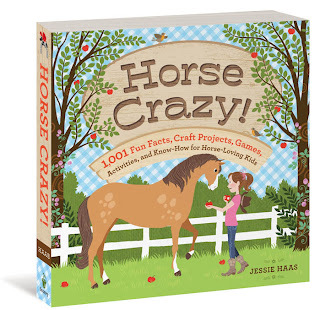 Jessie Haas is the author of more than 30 books for children, including both fiction and nonfiction, many focused on relationships with horses. Her young adult novel Unbroken was selected as a Best Book of 1999 by both Library Journal and Publishers Weekly. She is a member of the Author’s Guild and the Society of Children’s Book Writers and Illustrators. She lives in Vermont. As a knitter and crocheter, Jessie, I fully support the fiber arts in tandem with the equine arts.